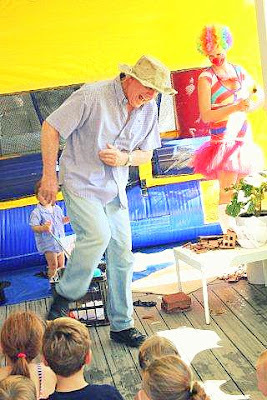 Finally - here are some photos from my daughter's circus party. The photo above is of the cute circus treat van. This is a van that my hubby uses for work and it was his idea to convert it into a cute treat van for the party. Great idea hubby! 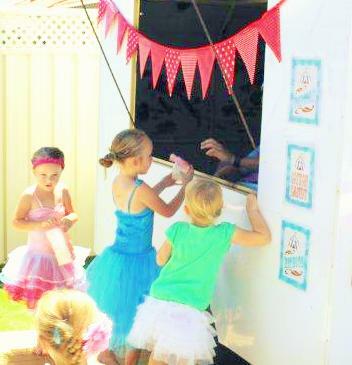 The kids loved lining up for treats that included fairy floss and pop corn. 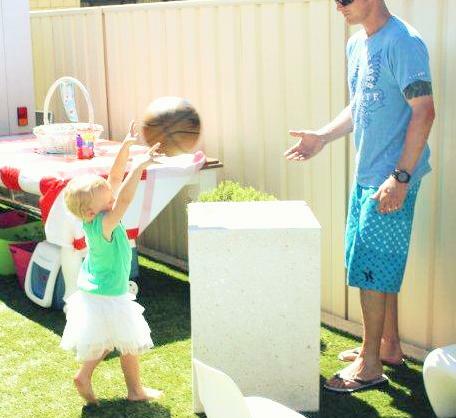 We set up some side show alley style games including this "throw the ball into the empty planter box" game. Here is our little birthday girl probably standing a little too close to the box - but hey - it's her party. You can't have a circus party without a clown - you can see my sister in the background dressed up as a very cool clown! The highlight of the party, according to most three year old guests, was the magic show (with my dad as the magician). Well done dad! In case anyone has spotted the broken brick - this was part of the magic show. 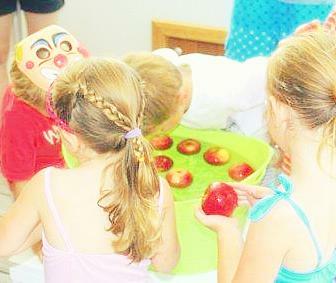 Here is the apple bobbing game. I wasn't sure if the kids would get into this game but they loved it. They even wanted to eat their apples! I had this dress up box set up outside for kids to play with. This was a very last minute idea but I am so glad that I put the dress up box together. 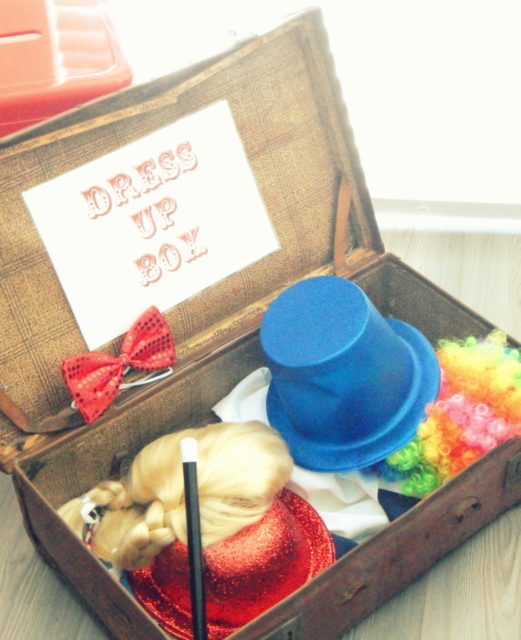 The kids loved it and they seemed to enjoy rummaging through the box and trying the dress up items on. Thanks to my dad for finding me the very cool old suitcase. I printed the sign off at home using a font that I downloaded for free. The font is JF Ringmaster. I nearly didn't have this photo. I was too busy at the party to think about taking photos. I found this photo on my camera - so thank you to a very considerate friend for taking this photo for me! 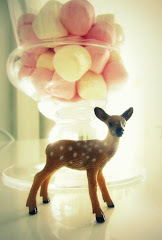 Anyway -lots of yummy treats for the kids (and big kids). The kids loved scooping these treats out and into little treat bags that were sitting close by. 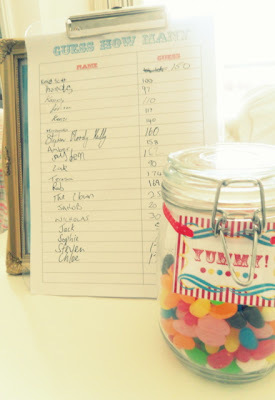 The sweet Candy Buffet sign is from Inviting Printables Etsy Shop. This was also another last minute idea - "Guess How Many" game. I am glad that I had this game as the adults also participated. The prize was of course the jar of jelly beans. The cute little Yummy food tag (and the lolly tags above) were from Paper Mints Printables Etsy shop. I made these cute clown nose biscuits - inspired by star/wand biscuits by Donna Hay. I loved watching the kids play with these biscuits. I set up a little photo props station for people to take photos of themselves with my camera using some of the photo props that I had made. Here is a photo of my silly brother-in-law. He is such a crack up! It was such a great birthday party. A lot of work - but definitely worth it!